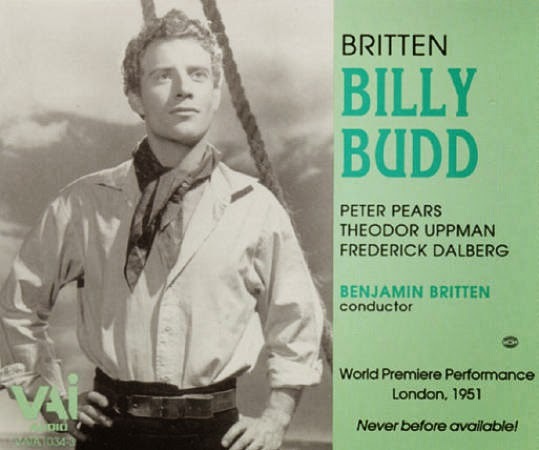 Celebrating Benjamin Britten's "Billy Budd"
Today we celebrate the anniversary of Benjamin Britten's opera Billy Budd, which premiered on December 1, 1951 at the Royal Opera House in London. Britten originally planned on having Sir Geraint Evans sing the title role, but the great baritone felt that the role sat too high for his voice. Britten opted for blond heart thrrob Theodor Uppman as his replacement. The opera received 17 curtain calls and Uppman was acclaimed as a new star. Evans remained in the cast as Mr Flint. Billy Budd received its United States première in 1952 at Indiana University with Jack Gillaspy in the title role. Gillaspy went on to have a career primarily in Germany under the name John Gillas. It was acclaimed by British critics as a masterpiece when published in London, and quickly took its place among the canon of significant works in the United States. In 1960 Britten revised the score substantially in preparation for a BBC broadcast, and compressed it into two acts. Vere's first appearance after the prologue had been originally the Captain's Muster, in which he addresses the crew at the end of Act 1; Britten cut this, explaining to his librettist Eric Crozier that he had never been happy with that scene, so making Vere's first appearance on the ship a private moment alone in his cabin. Britten changed some of the structural balance from the contrasting Acts 3 and 4. The original version in four acts is still occasionally revived, such as at the Vienna State Opera in 2001 and 2011, and has been recorded at least twice. The opera was produced on November 6, 1970 at the Lyric Opera of Chicago, with Uppman reprising the title role; the cast also included Richard Lewis as Vere, Geraint Evans as Claggart, Bruce Yarnell as Redburn, Raymond Michalski as Flint, and Arnold Voketaitis as Ratcliffe. The opera has become a calling card for barihunks, as Herman Melville described Billy Budd as a fine physical specimen at age twenty-one, renowned for his good looks and gentle, innocent ways. It was recently performed in Berlin with John Chest in the title role, who we once described as a Brad Pitt lookalike. Other recent barihunk portrayals include Liam Bonner at the L.A. Opera, calendar model Craig Verm in Santiago, Jacques Imbrailo at Glyndebourne and in Amsterdam, Lauri Vasar in Berlin, Lucas Meachem in Paris, Teddy Tahu Rhodes in Sydney and Santa Fe, and Daniel Belcher in Houston. 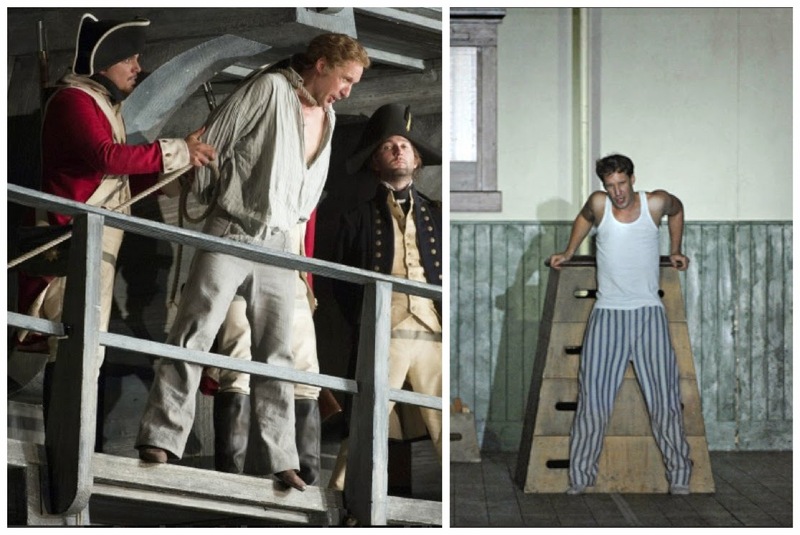 Other famous barihunk Billy Budd's include Simon Keenlyside, Peter Mattei, Nathan Gunn, Rod Gilfry, Bo Skovhus and Thomas Hampson. The author E. M. Forster had an interest in the novella, which he discussed in his Clark lectures at Cambridge University. Having admired Britten's music since attending a performance of The Ascent of F6 in 1937, he first met the composer in October 1942 when he heard Peter Pears accompanied by Britten perform the Seven Sonnets of Michelangelo at the National Gallery. In 1948, Britten and Forster discussed whether Forster might write an opera libretto, and by that November, Britten seems to have mentioned Billy Budd as a possible work to be adapted. Forster agreed to this project, and worked with Eric Crozier, a regular Britten collaborator, to write the opera's libretto. The next scheduled Billy Budd is at the Teatro Carlo Felice in Genova in April 2015 with Philip Addis in the title role. 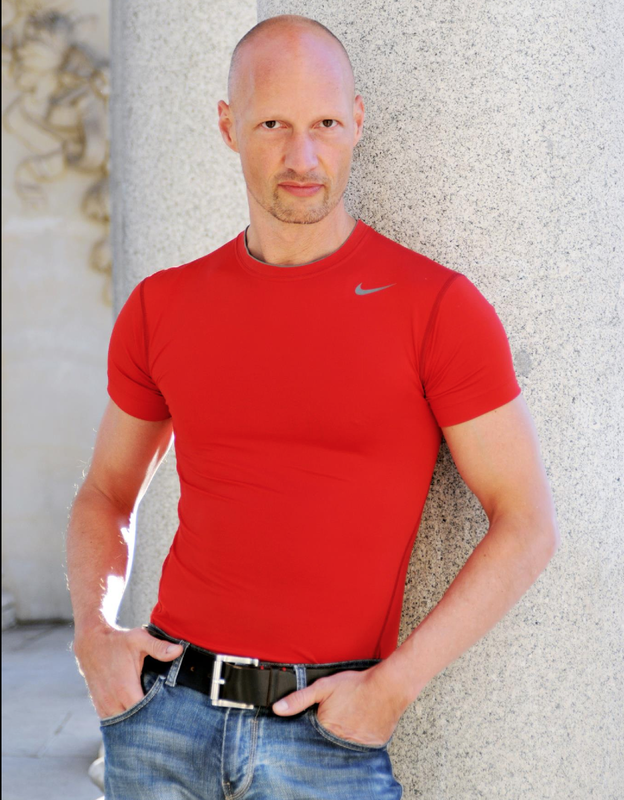 Make sure to order your 2015 Barihunks Charity Calendar, which includes the 2014 Paris Opera Award winner Pietro di Bianco and 18 more of opera's hottest men!!! Click below. Georg Nigl stars in Stuttgart's hit opera "Jakob Lenz"
One of the hits of Oper Stuttgart's season has been Wolfgang Rihm's one act chamber opera Jakob Lenz starring Georg Nigl. It has one more performance on December 12th, which is completely sold out. Lenz, who along with Johann Wolfgang von Goethe, formed the “Sturm und Drang” (Storm and Stress) movement in German literature which made German authors the cultural leaders of Europe during the 18th century. The opera is based on the novella "Lenz" by Georg Büchner which deals with an incident in the life of the German poet. The source of Büchner's material comes from the diaries of the social reformer and priest Johann Friedrich Oberlin, which detail the activities of his house guest, who was clearly suffering from mental illness at the time. The suicidal poet stayed with Oberlin in a small village in the Vosges Mountains near the German-French border in the hope of recovering from his depression. The opera was first performed at the Hamburg Staatsoper in 1979 with the late English baritone Richard Salter in the title role. It has subsequently been performed at the Wiener Festwochen with Georg Nigl, Teatro Comunale di Bolgna with Tomas Möwes and the English National Opera with Andrew Shore. Austrian baritone George Nigl began his singing career with the famed Vienna Boy's Choir. He went on to study as a baritone and an actor, performing with the Vienna Burgtheater. He has gone on to sing at many of the major opera houses in Europe, including La Scala in Milan, Staatsoper Unter den linden in Berlin, Théâtre de la Monnaie in Brussels, Bolshoi in Moscow, the Festival Aix-en-Provence, the Salzburg Festival and the Wiener Festwochen. A number of contemporary composers have written works for him, including Pascal Dusapin, Wolfgang Rihm, Friedrich Cerha, Georg Friedrich Haas, Olga Neuwirth, Salvatore Sciarrino, Wolfgang Mitterer, and Peter Eötvös. 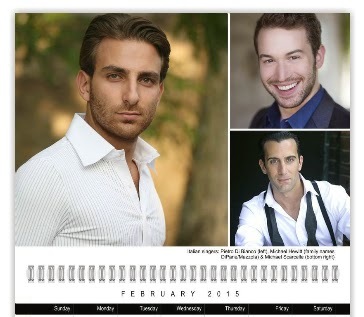 Make sure to order your 2015 Barihunks Charity Calendar and enjoy 19 of opera's hottest baritones. About two weeks ago, we introduced Czech barihunk David Nykl to readers. Now we've learned that he'll be performing as Nunzio in Vít Zouhar and Tomáš Hanzlík's reworked version of Jacopo Peri and Jacopo Corsi's 416 year old opera La Dafne. The original version was performed for the Grand Duchess of Tuscany, Christina of Lorraine, in 1598 and is considered the first opera. Vít Zouhar and Tomáš Hanzlík pieced together and reworked the opera for theorbo, cello and organ from existing fragments of music. The piece premiered on June 25, 2011 at the Mozart Hall a the Reduta Theatre in Brno, Czech Republic. The piece is being performed again at the same theatre beginning on December 2nd. The production is being performed as as closely as possible to how it would have been done for early nobility, including being set by candlelight. Click HERE for additional information or tickets. At least one performance is already sold out. There is another version of a Dafne reconstruction available on YouTube. Don't forget to order your 2015 Barihunks Calendar, filled with 19 of opera's sexiest barihunks. 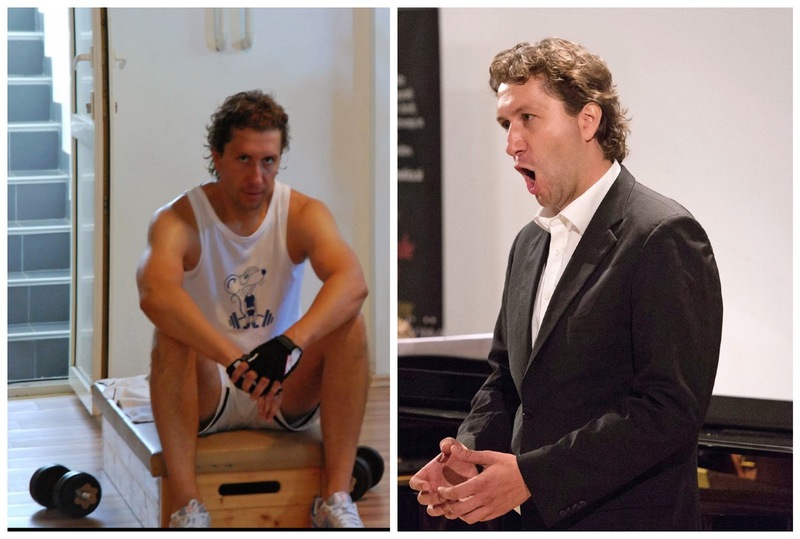 We recently ran a photo of 31-year-old Croatian bass-baritone, Krešimir Stražanac on our Facebook feed as our "Gratuitous Picture of the Day" [top left photo]. Needless to say it created a bit of buzz amongst our readers. It was subsequently brought to our attention that we've never properly introduced him to readers. Stražanac studied at the Hochschule für Musik und darstellende Kunst in Stuttgart. He went on to win the International La Voce Competition of the Bavarian Radio for art song and the International Cantilena Competition in Bayreuth for opera/operetta. 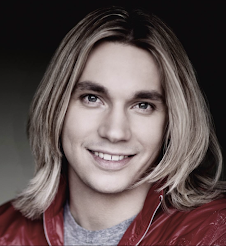 In September 2012, he won the International Hugo Wolf Competition in Hugo Wolf's birthplace in Gradec, Slovenia. Since the 2007-2008 season, he's been a member of the ensemble at the Opernhauses Zürich, where he's performed Ping in Turandot, Harlequin in Ariadne auf Naxos, Don Fernando in Fidelio, Morales in Carmen and Prince Yamadori in Madama Butterfly. In November 2012, he made his debut as Dr. David Livesay in the world premiere of Frank Schwemmer's Die Schatzinsel and in March 2013 in the role of Baron Tusenbach in Péter Eötvös' opera The Three Sisters. He can be heard in complete recordings of Bizet's Carmen, Die Meistersinger von Nürnberg and Fidelio. WQXR's broadcast of the Berlin Philharmonic under the baton of Alan Gilbert on December 9th will feature barihunk Michael Nagy in two of three works on the program. The program will start with Bach's Ach Gott, wie manches Herzeleid, BWV 58. The piece is scored for soprano and bass, two oboes, taille, two violins, viola, and basso continuo, with no choral interventions. He'll be joined by German soprano Christina Landshamer. The bass recitative talks about the history of persecution. The piece will be followed by Mendelsohn's Third Symphony, Opus 56. Landshamer and Nagy will then return for Carl Nielsen's Symphony #3 (Sinfonia Espansiva). The symphony is the only one that Nielsen wrote that includes vocal music, as the second movement includes a wordless vocal part for soprano and bass-baritone. In some performances the soprano is replaced by a 4th clarinet and the bass by a 4th trombone. The broadcast will be on Tuesday, December 9th at 9 PM EST (6 PM PST). The show is hosted by WQXR’s Annie Bergen and runs two hours. 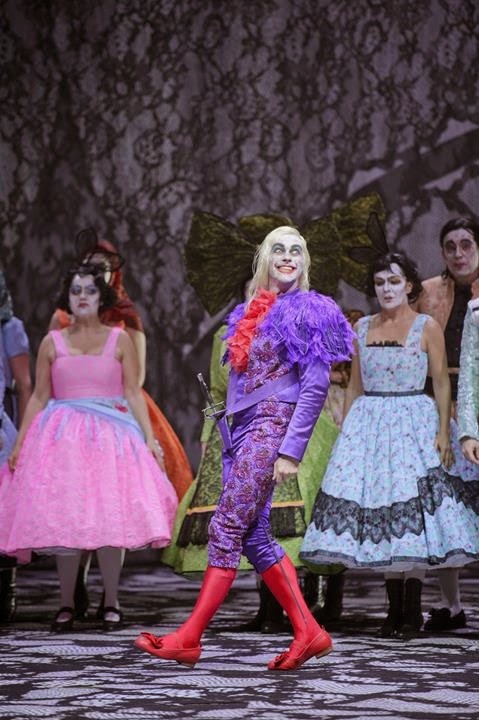 In December, he takes on Papageno at the Bavarian State Opera in a cast that includes fellow barihunks René Pape as Sarastro and Tareq Nazmi as the Speaker. Tickets and additional cast information are available online. 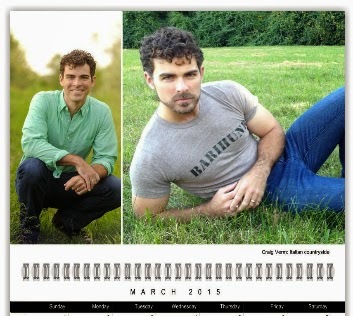 Make sure to order you 2015 Barihunks Charity Calendar before the big holiday rush. It features 19 of the hottest men in opera. Who says that we don't make dreams come true at Barihunks? 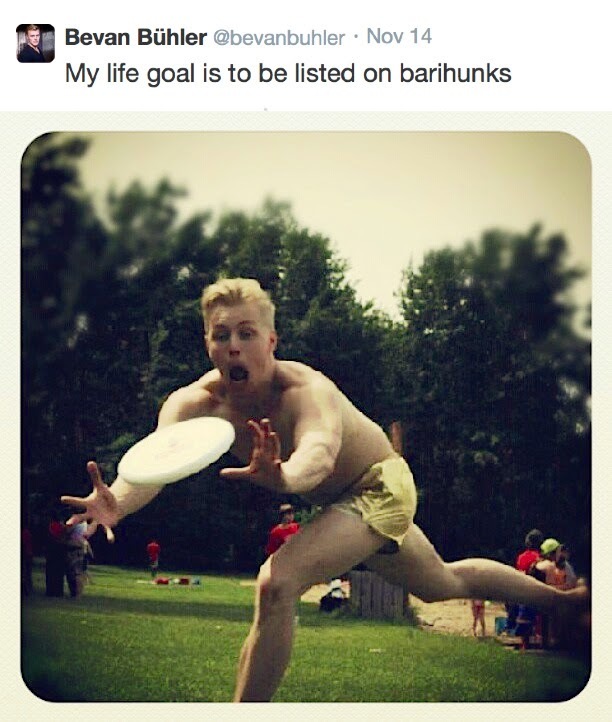 Canadian barihunk Bevan Bühler posted the following on Twitter: "My life goal is to be listed on barihunks." We get a lot of requests for singers to appear on the site, but this one seemed like a no-brainer. In 2012, he one of eight finalists in the Discovered international model search, which raised funds for the Children's Wish Foundation. After completing his Associate Degree in piano performance, Bühler began his journey as a singer when he was given the opportunity to play Rolf in Rodgers & Hammerstein's The Sound of Music in his hometown of Yorkton, Saskatchewan. Since then, Bühler has performed various solo and chamber recitals and has been featured at the Edmonton Vocal Arts Festival and the Saskatoon Music Festival. Bühler has also joined the casts of Richard Strauss' Ariadne auf Naxos and Handel's Alcina with Opera Nuova and has performedin Mozart's Le Nozze di Figaro and Purcell's King Arthur with Saskatoon Opera. 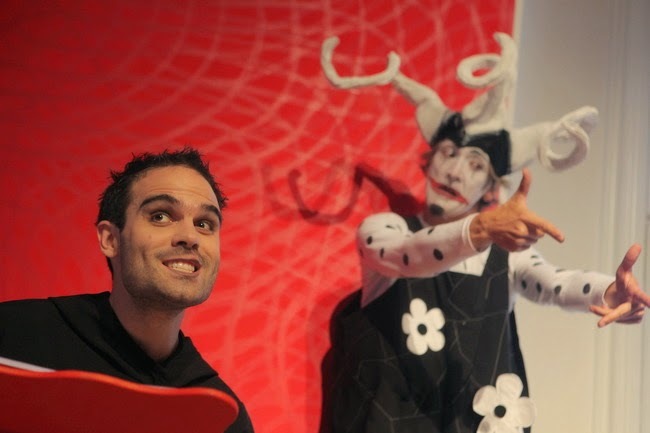 Bühler began his 2014-15 season by singing Ramiro in Maurice Ravel's comedic opera, L'heure Espagnole, presented by University of Western Ontario Opera (UWOpera). Under the direction of Michael Cavanagh, Bühler's character effortlessly was required to lift and carry large clocks on and off stage. To no one's surprise, he got the girl in the end. Future engagements include the role of the villain, Caiaphas, in Jesus Christ Superstar with Musical Theatre Productions London, as well as performing as a featured soloist with the University of Western Ontario Opera's cast at the University's Opera Gala this spring. Off stage, Bühler spends his free time outdoors - including replanting forests in British Columbia during the summer - or in the weight room where he is a certified personal trainer. Singer! Model! Personal Trainer! Socially conscious good-guy! 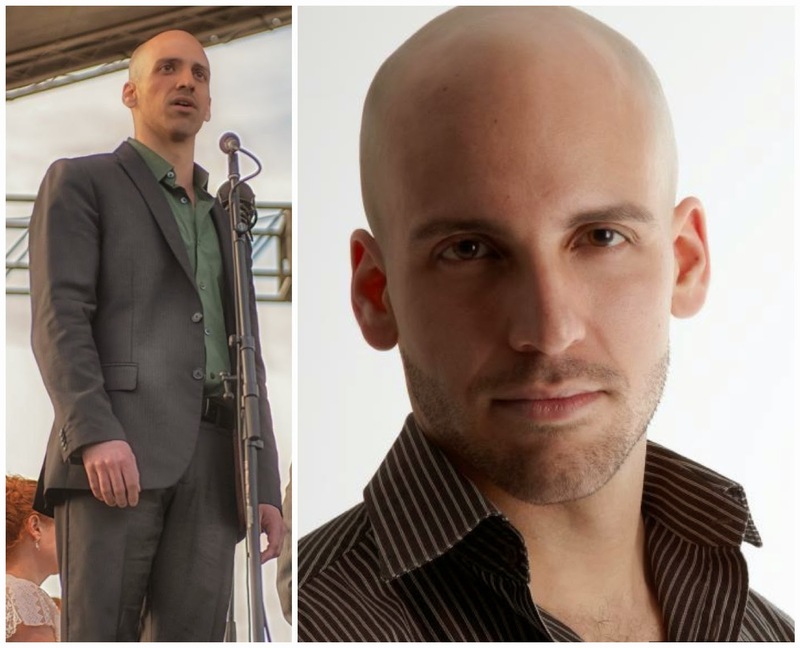 Welcome to the barihunks family! If you want to enjoy 19 more of the sexiest men in opera, make sure to order your 2015 Barihunks Charity Calendar today by clicking below. German barihunk Günter Papendell seems to live on the stage of he Komische Oper in Berlin in a tank top or shirtless (and we're not complaining!). He's returning to the title role in Mozart's Don Giovanni on November 30th in the colorful, whimsical and provocative production by Herbert Fritsch. You might recall we posted about him the last time he sang the role in Berlin, so you may have guessed that it's a favorite performance of ours. Papendell has been with the Komische Oper since 2007, appearing as Marcello in La Bohème, Malatesta in Don Pasquale, Kothner in Meistersinger, Jeletzky in Pique Dame, Förster in Schlaues Füchslein, Giorgio Germont in La Traviata, Odysseus in the Monteverdi trilogy, Demetrius in Britten’s Midsummer Night’s Dream, Pollux in Castor et Pollux by Rameau, Mary in Die Soldaten by Zimmermann and Marquis Posa in Don Carlo. Next year, Papendell sings the title role in Puccini's Gianni Schicchi, Achilla in Handel's Giulio Cesare and a return as Odysseus in the Monteverdi trilogy. 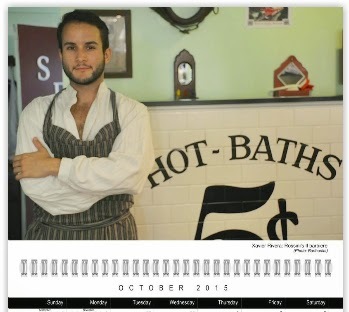 Make sure to order 2015 Barihunks Charity Calendar by clicking on the LULU button below. 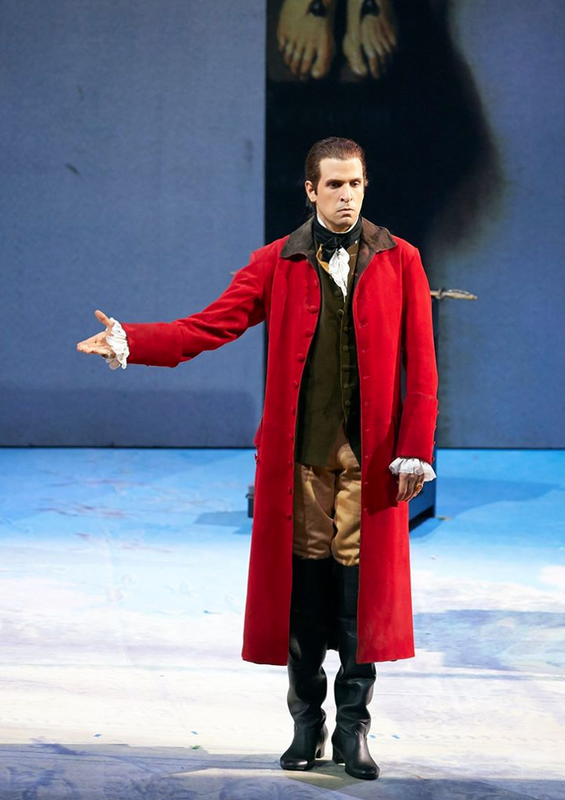 The Vienna State Opera's live streaming opera service will be presenting Luca Pisaroni in Mozart's Le nozze di Figaro on February 25th at 5:30 PM CET/11:30 AM EST/8:30 AM PST). The service requires a log-in and the first seven days are free. On demand operas will cost €14.00 ($17.40) for a single opera with subscriptions available. The service also includes the option to view multilingual subtitles and to follow along with the score. The cast also includes Adam Plachetka as Figaro, Olga Bezsmertna as the Countess and Anita Hertig as Susanna. The Vienna State Opera produces more than 40 live broadcasts annually, and is making nearly all of its 2014-15 season productions available in Ultra HD via the Internet, smart TVs and mobile devices. Click HERE to start watching now. Pisaroni returns to the U.S. early in the new year, with a performance of Beethoven's Missa Solemnis in January with the Los Angeles Philharmonic under the baton of Michael Tilson Thomas. He then heads to the Met in February for a run as Leporello in Mozart's Don Giovanni. Peter Mattei sings the title role. Don't forget to order your 2015 Barihunks Charity Calendar before the busy shopping season begins. Two of our favorite barihunks, Jérôme Varnier and Stéphane Degout, will share the stage in Debussy's Pelléas et Mélisande with the Philharmonia Orchestra in London on Thursday, November 27th. Esa-Pekka Salonen will lead the performance which also includes Felicity Palmer as Geneviève, Monica Bacelli as Mélisande and Laurent Naouri as Golaud. Varnier is singing Arkël, which has become somewhat of a signature role, and Degout is singing Pelleas. Tickets and additional concert information are available online. Pelléas et Mélisande appears a lot on Varnier's upcoming performances, including singing Arkël at l'Opéra National de Lyon, and the dual roles of Un Médecin and Le Berger at the Paris Opera. He'll be joined in Paris in Robert Wilson's famous production by Stéphane Degout, who is singing Pelleas. Performances in Paris run from Febuary 7-28 and tickets are available online. We also wanted to share with you the newest photo of Jérôme Varnier [above] taken by fellow barihunk/photographer L'Oiseleur des Longchamps. 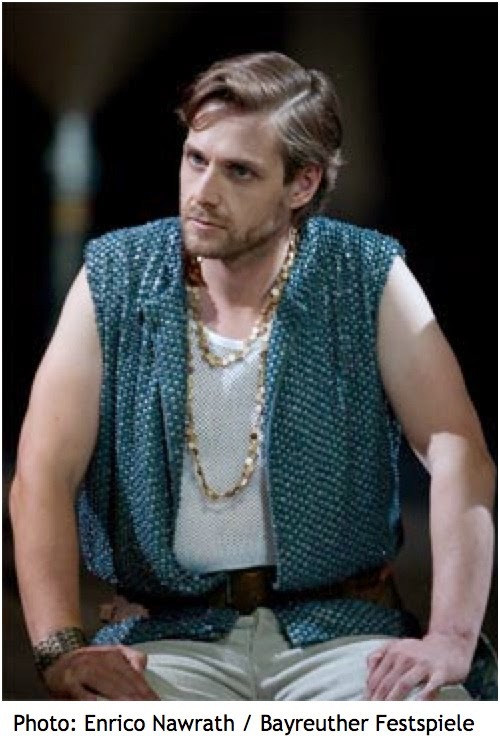 The latter appears in our new 2015 Barihunks Charity Calendar [below]. We hope to feature more of his amazing work in the future. Order your calendar featuring L'Oiseleur des Longchamps today by clicking below. The world of opera has seen its fair share of controversies, including the political censorship of Verdi operas, outrage over the sexual nature of Richard Strauss' Salome and the recent protests over John Adams' The Death of Klinghoffer at the Metropolitan Opera. Much of this pales to the reaction that greeted Hans Werner Henze's oratorio Das Floß der Medusa (The Raft of the Medusa) in Hamburg, Germany in 1968. The piece, which was written as a requiem for Che Guevera, had advertisements torn down, protests, chanting and the chorus actually walkng off the stage chanting that they wouldn't sing under the "red flag," a reference to the communist flag that had been hoisted by students. Scuffles ensued in the audience, the police had to be called and the performance was cancelled. The piece has subsequently had a few performances without incident and is scheduled for two performances beginning tonight with baritone Roman Terkel and the Concertgebouw Orchestra in Amsterdam. Das Floß der Medusa tells the story of the French frigate Meduse, which ran aground off the west coast of Africa in 1816. 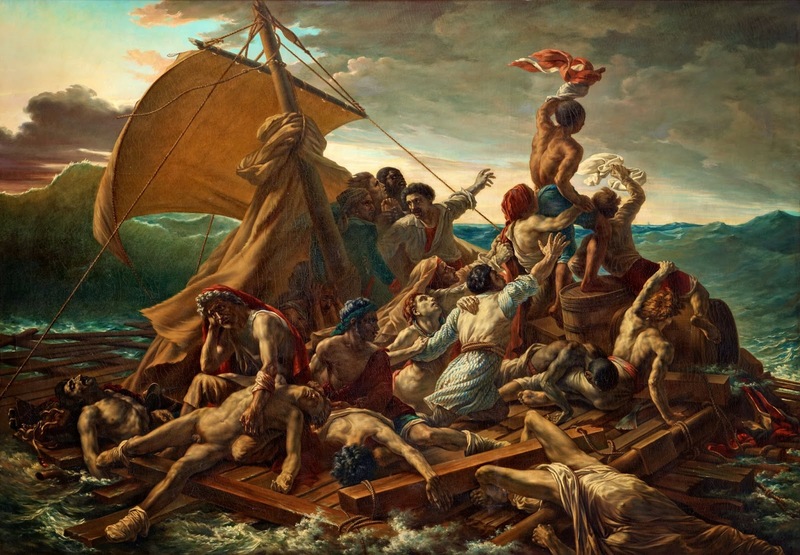 It marks an ignominious episode in French political and maritime history, and was later immortalized in the painting of the same name by Théodore Géricault. The piece is written for soprano, baritone, speaker, choir, children’s choir and orchestra. The choir, as a collective mass, plays an important role and expresses its visions of death in floating, nearly impossible sounds. At the apotheosis, which features the Vietnam war, Henze based his rhythmic patterns on the chants in honor of Ho Chi Minh. As Henze's oratorio builds to its climax, the "dead" move from the choir of the living to that of the dead, which is full of both adults and children, creating an imbalance on the stage. Tickets and additional information are available online. Mildly less controversial is our 2015 Barihunks Charity Calendar, which is available by clicking on the LULU button below. American barihunk Rodolfo Nieto, who we introduced to readers during his run as Jose Castro in Minnesota Opera's La Fanciulla del West two months ago, will be giving a free recital on Friday, November 21st. The free concert at Bemis Rehearsal Hall will include love songs by Richard Strauss, Schubert, Chausson, Fauré, and Tosti. The concert is free, but an RSVP is requested. If you can't make the recital, you can listen to him HERE singing some Schubert songs. Make sure to order your Barihunks Charity calendar by clicking below and enjoy 19 of opera's hottest men all year. Baritones are once again dominating a major singing competition, as a third of the finalists at the prestigious Paris Opera Awards were from our favorite voice range. Pietro di Bianco, Sam Roberts-Smith and Xiaohan Zhai have all advanced to the final round and di Bianco walked away with the top prize for male singers. Soprano Daria Terekhova took the top prize for women. In fact, all three of the top prizes plus the audience prize went to the low voices. Xiaohan Zhai took second place and Sam Roberts-Smith won both third place and the Special Jury Prize for the best performance. Marina Nachkebiya and Leonie Renaud took second and third place for the women. Di Bianco will receive €5000 ($6300 US) for taking the top prize, Zhai receives €3000 ($3800 US) and Roberts-Smith €1000 ($1250 US) for each of his prizes. You can enjoy Pietro di Bianco for the entire month of February in our new Viva, Italia! 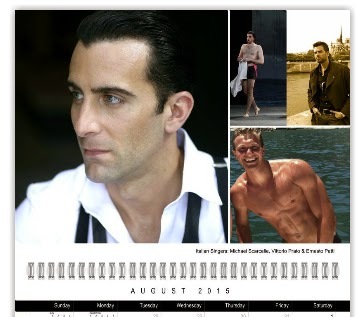 Barihunks Calendar, which is available by clicking below. Canadian barihunk Jonathan Estabrooks is returning to his native country to perform with the Vancouver Symphony. He'll be making a familiar foray from opera to the world of musical theater, as he joins soprano Amy Wallis and tenor David Curry in an evening of music by Lerner and Loewe. They'll perform under the baton of Steven Reineke on Friday, November 21 and Saturday, November 22 at the Orpheum Theater. Tickets are available online. The duo is known for creating some of the greatest musicals of all time, including Camelot, My Fair Lady, Brigadoon, Paint Your Wagon, and Gigi. Estabrooks will be performing such familiar hits as If Ever I Would Leave You, They Call the Wind Maria and Gigi. Estabrooks will also be signing copies of his debut album ‘These Miles’ after the show in the main lobby. If you can't make it to Vancouver, you have plenty of time to buy tickets for his performances with the Seattle Symphony and Steven Reineke when he takes on the Broadway classics of Rodgers & Hammerstein from March 6-8, 2015. Tickets are available online. 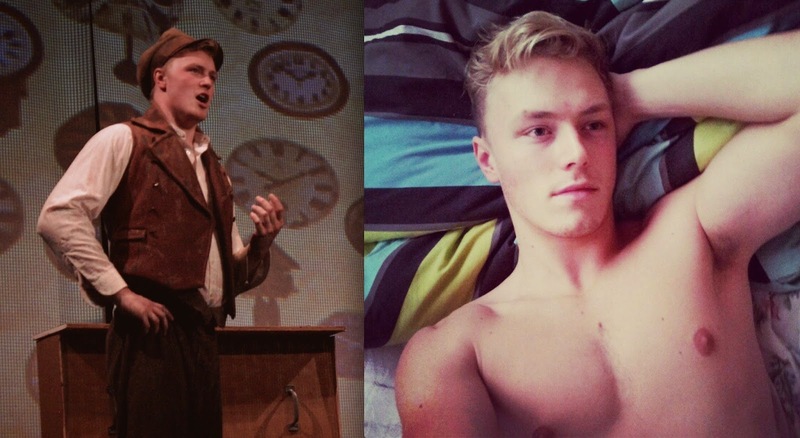 Jonathan Estabrooks isn't in this year's Barihunks calendar, but he has appeared in previous years. However, you can still enjoy 19 more of the hottest guys in the opera world by ordering your copy today. Just click the handy LULU button below. Sterling, Colorado probably doesn't get many Metropolitan Opera stars performing in their town of 18,000 people. The city, which was a stop on the Overland Trail during the mass migration to California after the Gold Rush is a good two hour drive northeast of Denver on the way to rural Nebraska. But fortunately for the good citizens of Sterling, Met star Keith Miller grew up a little further down the road in Ovid, Colorado. On Saturday, November 22, he will perform at First Presbyterian Church in Sterling at 2 PM. The concert is free with a suggested offering to the church. He will be joined by soprano Melissa Zapin and pianist Konstantin Soukhovetski in a program of holiday standards, as well as music from Gounod's Faust, Puccini's La boheme and Gianni Schicchi, and Mozart's Don Giovanni and Le nozze de Figaro. Miller, has deep roots in the area, having played fullback for the University of Colorado and being drafted into the NFL. It's also no coincidence that Sterling would want someone with his background in sports and music, as the Valley School District has won awards for having some of the best music and athletic programs in Colorado. Miller is featured in our Barihunk calendar for the second year in a row. This year as part of our Viva, Italia! theme, he was part of a photo shoot in New York City's Little Italy with fellow barihunks Donovan Singletary and Christopher Temporelli. You can order you calendar by clicking below. American barihunk Benjamin Werth, who has made his career in Europe in recent years, is making his debut with the opera at Theater Aachen in Leonard Bernstein's West Side Story. Werth is singing Riff, the gang leader of the Jets who suggests the rumble with the Sharks. Since 2009, Werth has been part of the ensemble of the Landestheater Coburg where he sang Orest in Gluck's Iphigenie auf Tauris, Malatesta in Donizetti's Don Pasquale, Renato in Verdi's Un ballo in Maschera, Figaro in Rossini's Barber of Seville, Zurga in Bizet's The Pearl Fishers and the title role in Tchaikovsky's Eugene Onegin. This won't be his first foray into Broadway musicals, as he performed Sam in George Gershwin's Crazy for You in 2011. An additional bonus in this production is the physical dancing of Jochen Kool, who portrays fellow Jets gang member A-Rab. Performance begin on Friday, November 21st and run through the Spring of 2015. Tickets and additional cast information are available online. The 2015 Barihunks Charity Calendar is available in plenty of time for the holidays. Order yours today! Who submitted the sexiest photo?